Trusted by schools across the country, Early Language and Literacy Classroom Observation (ELLCO) Tool helps build better literacy programs by assessing the quality of both the classroom environment and teachers' practices. With ELLCO, you can gather the essential data needed for professional development and program improvement that lead to better literacy outcomes for young children. Age Focus: Pre-K. Set of five booklets, 44 pgs. each. 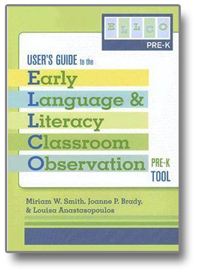 Trusted by schools across the country, Early Language and Literacy Classroom Observation (ELLCO) User's Guide helps build better literacy programs by assessing the quality of both the classroom environment and teachers' practices. With ELLCO, you can gather the essential data needed for professional development and program improvement that lead to better literacy outcomes for young children. 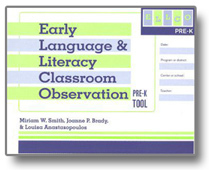 This user's guide explains how to implement Early Language and Literacy Classroom Observation (ELLCO) Tool. Age Focus: Pre-K. Softbound, 104 pgs.